Consumables and Kits｜BEX CO., LTD.
BEX provides unique consumables and Kits for bioscience research, from detection kits which BEX developed itself such as buffer, markers, primer sets, etc. to imported products such as detection kits. All of them are useful for your research. ●Transfection efficiency is improved with electroporation buffer BEX developed. ●Straight Walk® Kit clones an unknown region in genome. 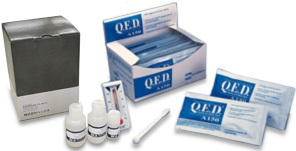 ●Forensic kit which detects alcohol concentration in blood through alcohol concentration in saliva.